Spray 13x9-inch glass baking dish with cooking spray. In 10-inch skillet, cook sausage over medium heat 8 to 10 minutes, stirring occasionally, until no longer pink. Drain on paper towel. Spread frozen potatoes in baking dish. Sprinkle with sausage, green chiles and 1 1/2 cups of the cheese. In medium bowl, beat eggs, milk and salt with fork or wire whisk until well blended. Pour over potato mixture. Sprinkle with remaining 1 1/2 cups cheese. Cover and refrigerate at least 8 hours but no longer than 12 hours. Heat oven to 350°F. Bake uncovered 50 to 60 minutes or until knife inserted near center comes out clean. Let stand 10 minutes. Cut into squares. Serve with salsa. If you can’t find a 12-ounce package of pork sausage, you can use a 16-ounce package. No need to wait! You can bake this dish right away if you like. Warm corn bread with honey butter and a fruit salad of orange, grapefruit and mango pieces give your brunch a southwestern flair. 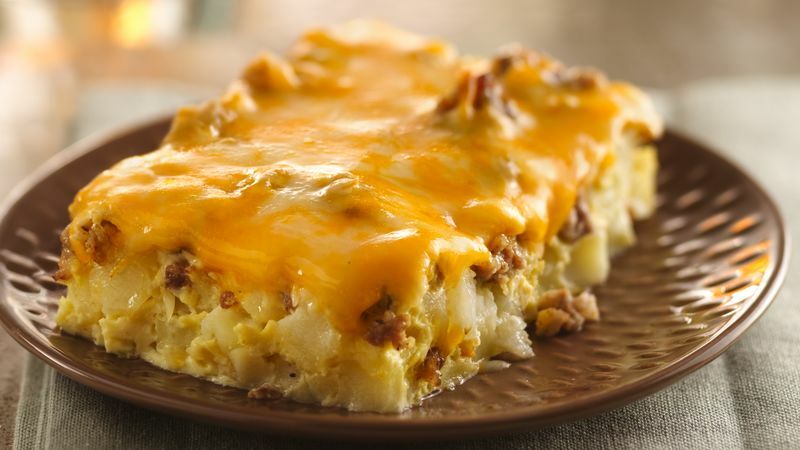 Cubed hash brown potatoes are called “southern-style,” and shredded potatoes are called “country-style.” Either one can be used in casseroles like this.